When you are dealing exclusively with chocolate, it is nearly impossible to go wrong. This week at Young Chefs, we made no exceptions to this rule as we investigated crystalline structure and formation with regards to dark chocolate. As we transformed solid chocolate into its delectable liquid form and back again, we not only developed an understanding of molecular interactions, but we also explored the the complex process of chocolate production. From a culinary angle, the lesson took no convincing. 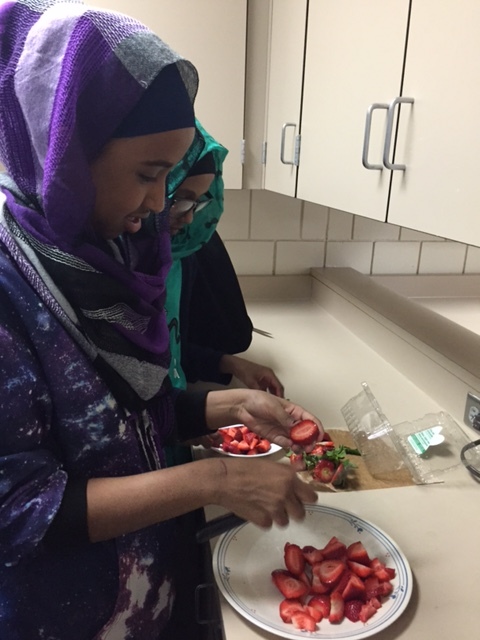 The kids were ecstatic upon discovering that we would be melting chocolate and then be dipping an array of fruits, pretzels and marshmallows into the sweet, rich product. 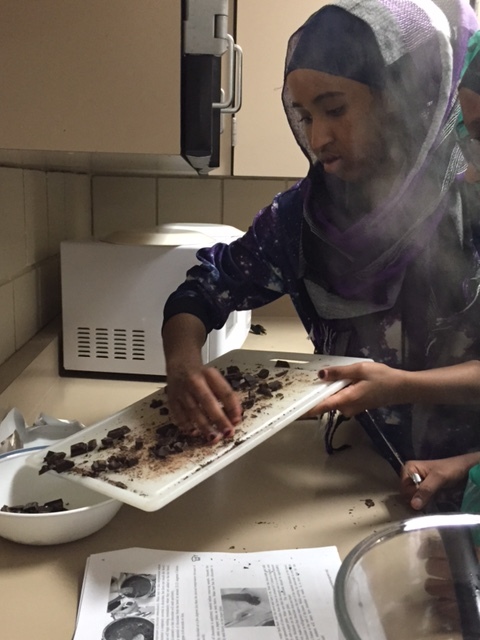 Before we began the cooking process, we passed around a square of dark chocolate for them to taste and describe. Their enthusiasm was tempered slightly because the dark chocolate was “bitter”, “gross” and was not “normal good chocolate”. Despite this, they were able to describe their samples as creamy, smooth and shiny. These descriptors provided the perfect segue into the science portion of the lesson. As it turns out, chocolate is a fairly complex substance. Its principle ingredients are cocoa butter and fat crystals. The fat crystals can align in six different ways which means that the chocolate is said to have six distinct crystal states. Each of these states has unique chemical and physical properties including shine, hardness and melting point. Crystal state 5 is a highly ordered state and, as a result, if the chocolate is in this form, it is glossy, smooth and hard. It also melts at 34°C which is a higher temperature than most most of the other crystal states. As it turns out, it is difficult to make chocolate harden into this desirable crystalline structure. To do so, the chocolate must be melted to exactly 34°C, then removed from the heat to harden. If the chocolate is warmed up any more than this, the molecules move too quickly to have order when they are suddenly removed from the heat. 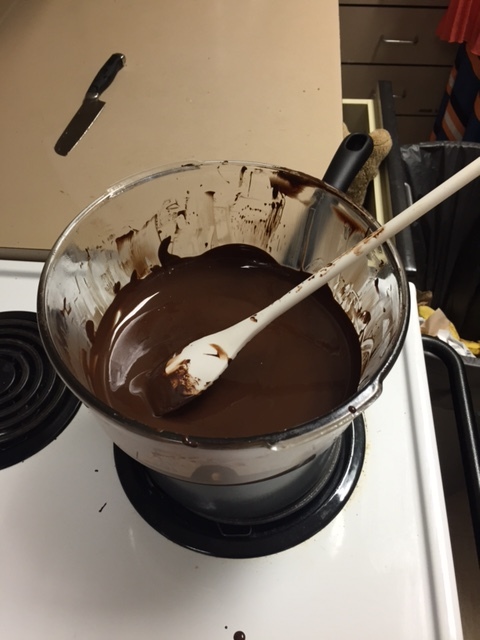 With the goal of 34°C, we began to melt chocolate over a double boiler. As we stirred, we paid close attention to the thermometer. Within a minute, the chocolate reached the ideal point and we removed a spoonful and allowed it to harden. We continued to heat the rest of the chocolate so that we could compare the crystals that from from warmer melted chocolate to those made with 34°C chocolate. As the chocolate heated, we had a chocolate exploratorium. We had a cocoa pod, cocoa nibs, cocoa powder, cocoa butter and, finally, a bar of chocolate so that they could see how the chocolate becomes the substance that we know and love. This part of the lesson went over extremely well and the chefs loved tasting the chocolate at the different phases of production. By the time the exploratorium was done, the two samples of the chocolate had hardened and they were able to compare the chocolate that had been melted at different temperatures. Though the differences in the appearances were subtle, it was clear that the chocolate that had been warmer melted much more quickly on the palm of their hands. 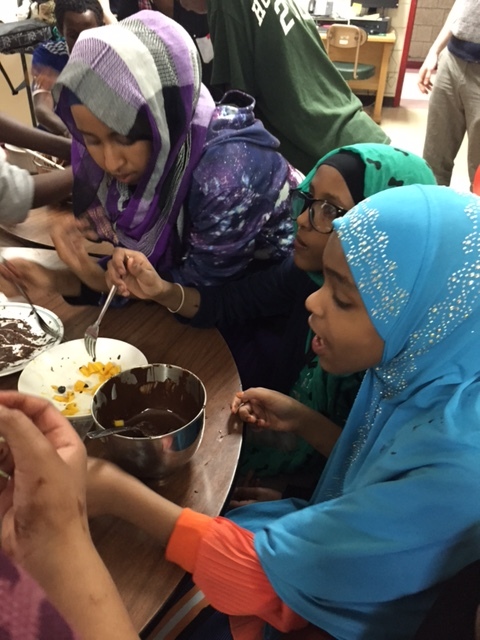 Using the remainder of the melted chocolate, we launched into the best part of the lesson— the eating phase. 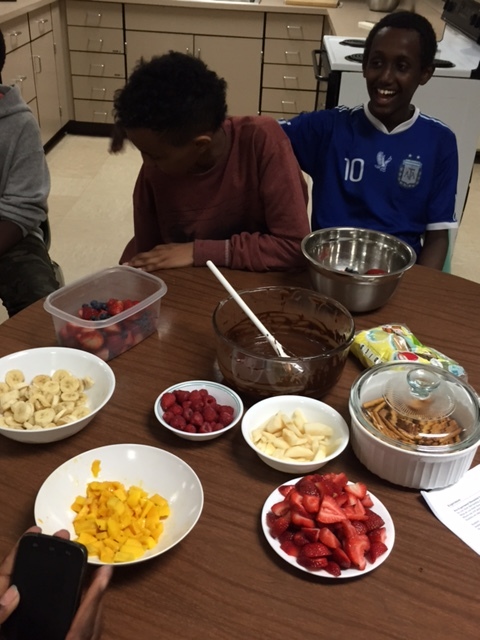 Using strawberries, bananas, mangoes, raspberries, blueberries, pretzels, marshmallows and pears as vehicles, the students scarfed down the chocolate, regardless of the fact that it was “disgusting” “weird” dark chocolate.